A delicious green colour that is sure to complement any wearer, the emerald gemstone is a unique and beautiful stone that is becoming rare due to its limited availability. Due to its stunning magnificence, much legend has arisen from this gemstone such as bringing ‘good luck’ and ‘enhancing health and wellbeing’. Ancient Egyptians were also said to idolise the beauty of the emerald. With green representing harmony, balance, growth and hope, the emerald takes on an even more beautiful connotation linked with the wearer’s physical and emotional beauty. Said to rejuvenate, nurture and encourage, many who are attracted to the deep green of the emerald admire it for its intense colour and splendour. Queen Elizabeth II is said to be a big admirer of the emerald gemstone, and has so many jewels she needs a special room to house it all in (not including the Crown jewels!). Another well-known icon, Elizabeth Taylor, received an emerald brooch as a wedding present paired with an emerald necklace – donning herself in gorgeous greens. Pop culture idol Christina Hendricks, known for her role in TV series Mad Men, has the emerald as her May birthstone, which would contrast beautifully with her magnificent auburn hair. She was also spotted at an event wearing a gorgeous emerald dress that showcased her voluptuous figure flawlessly and was set beautifully against her naturally light skin and deep auburn hair. The perfect colour to set against any skin type, the emerald gemstone boasts beauty, elegance and charm that is simply unmatched. 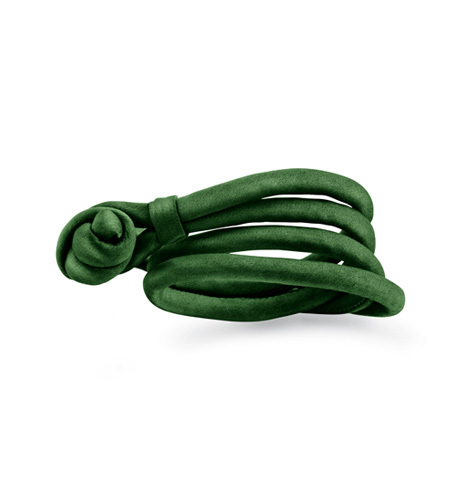 Wrap yourself in total indulgence with the luxurious Ole Lynggaard Copenhagen emerald green silk bracelet, with a desirably smooth silk lining and a simple and sophisticated design, this piece is sure to win the hearts of all who view it. 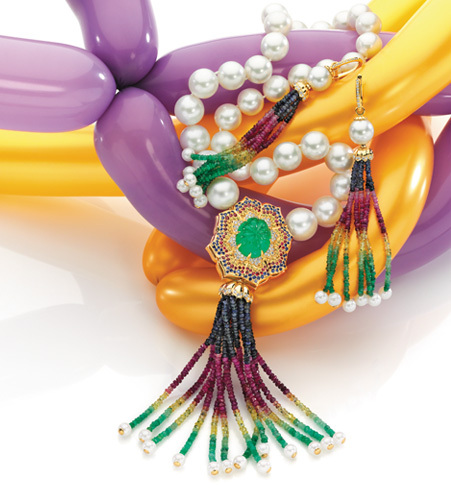 Discover the true beauty of colour, warmth and elegance with Kennedy Jeweller’s own ‘Ode to India’. This piece boasts a magnificent emerald that is the largest featured in any of our jewellery. Hand carved, this emerald is purely natural and weighs 19.77ct! At Kennedy Jewellers in Coffs Harbour our Master Jeweller is dedicated to providing the highest quality jewellery to meet every criterion. By meticulously hand-crafting our jewellery to perfection we are able to ensure you receive the best quality jewellery that is beautiful, unique and sophisticated. Kennedy Jewellers carry an extensive range of natural loose emeralds and with connections in Africa and South America, can source the world’s finest selection of emeralds. This paired with an on-site design and manufacturing service makes Kennedy Jewellers the ultimate destination for emerald lovers. To discover more about diamonds, or to book a design consultation at our Coffs Harbour showroom, please do not hesitate to contact us.